Padraig Harrington will be returning to Castle Stuart where he finished tied 14th in the Barclays Scottish Open last year. Picture ©Getty Images Three-time major Champion Padraig Harrington is hoping his love of links golf can help him to be crowned the king of Castle Stuart after confirming he will compete in the Aberdeen Asset Management Scottish Open from July 12-15, writes the European Tour. The Irishman finished tied 14th at the Inverness venue last year with rounds of 69, 67 and 68, and he will be looking to build on a promising start to 2012, which included a share of eighth place at the Masters Tournament in April. Renowned as a links expert following his Open Championship triumphs at Carnoustie in 2007 and Royal Birkdale the year after, Harrington is keen to display that kind of form again a week before he heads to Royal Lytham & St Annes Golf Club to try to win a third Claret Jug. “I loved the week in Inverness and am really looking forward to getting back to Castle Stuart,” said the 40 year old. “There was a great atmosphere all week last year and I enjoyed the area, the town and the golf course. “There is nothing quite like getting back to playing links golf the week before The Open Championship. It is ideal preparation for The Open, and I have always been in favour of taking the Scottish Open to a links venue for that reason. It is good to know that we have the opportunity to play links golf at Royal Portrush soon before Castle Stuart prior to tackling Royal Lytham and St. Anne’s. Harrington will join a strong field for the second staging of the Aberdeen Asset Management Scottish Open at Castle Stuart, with Luke Donald, who returned to World Number One on Sunday following his brilliant victory in the BMW PGA Championship, already confirmed to defend the title he won last year. Scottish pair Paul Lawrie and Martin Laird will lead the home challenge. Graeme McDowell lines up his birdie putt at his 18th in Barclays Scottish Open at Castle Stuart, Inverness, Scotland. Picture Stuart Adams /www.golffile.ie 8th July 2011If Rory McIlroy was wondering who might step up to challenge him in next week’s Open at Sandwich, he need look no further than Ireland’s other majors winners. Graeme McDowell and Padraig Harrington appear to have found their best form in the nick of time and if they don’t wear themselves out chasing the Barclays Scottish Open at Castle Stuart, they have more than enough game to bring Ireland yet more major glory at Royal St George’s next week. Both men took advantage of benign early morning conditions to race into contention for victory tomorrow with McDowell firing a bogey free, eight under par 64 to share the lead on 11 under par in the weather delayed second round. 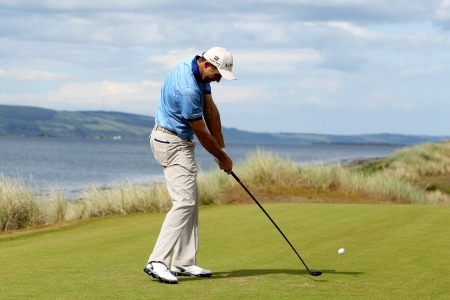 Padraig Harrington was 14th on his debut at Castle Stuart in last year’s Scottish Open. Picture Stuart Adams /www.golffile.ie Padraig Harrington wants to ride a wave of confidence to victory when he tees up his Open preparations at this week’s Scottish Open. Harrington's Open hope: "If I finish up here Sunday night, content with my game, I know I can win next week"
Padraig Harrington, who practiced at Nairn on his arrival in Scotland on Sunday evening, speaks to the press at Castle Stuart. Picture Stuart Adams www.golftourimages.comPádraig Harrington’s major winning game appears to be as elusive as the Loch Ness monster these days but the Dubliner will know on Sunday night if he is capable of winning a third Open Championship when he leaves Inverness after the Aberdeen Asset Management Scottish Open at Castle Stuart. Graeme McDowell’s last approach at Castle Stuart was from heavy rough. (10th July 2011: Picture Stuart Adams /www.golffile.ie)Graeme McDowell picked up the phone to agologise to Aberdeen Asset Management chief executive Martin Gilbert over his criticism of both the Scottish Open and Castle Stuart. Padraig Harrington during the second round of the 2013 Aberdeen Asset Management Scottish Open Picture Stuart Adams www.golftourimages.comPadraig Harrington said in the build up that he would have a good idea about his readiness for The Open on Sunday night. As it turned out, he will get time to reflect on that at Muirfield itself after he missed the cut by a shot in the Aberdeen Asset Management Scottish Open.